This page describes how to configure a Bamboo task to use a NAnt executable. 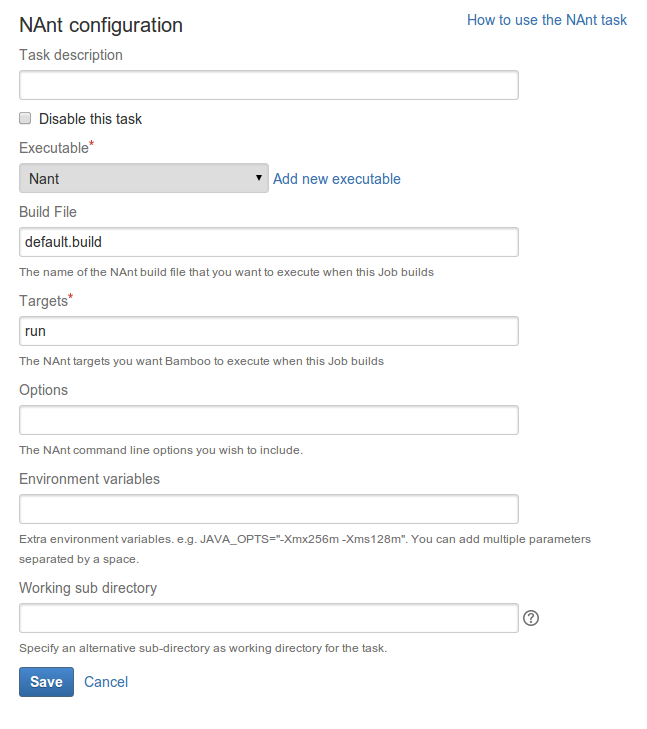 Click the name of the desired NAnt task, or click Add Task and then NAnt if creating a new task. The NAnt executable that is available to perform the task. The executable that you select will become one of the task's (and so, the job's) requirements. You can add other executables , if required. The relevant file name (e.g. default.build). You can include variables (see Bamboo variables). The NAnt target that you want Bamboo to execute. for example: run. You can also include variables (see Bamboo variables). The NAnt command line options that you want to include. You can also include variables (see Bamboo variables). Note that you cannot use Clover to collect code coverage for NAnt builds, as Clover only supports builders of Java/Groovy-based projects, such as Ant, Maven or Grails.